With the rapid advancements in technology, eCommerce has evolved as a strong business platform over the past few years. The Internet is not only helping the businesses to reach out to a large number of audiences but also improving the means for better customer engagement. Destination barriers are no longer prevalent and the customer reach is limitless. But what makes eCommerce such a huge success? Well, we can see that eCommerce never falls short of marketing ideas. Be it creating a buzz on the social media with hashtags or providing customized websites for the users, eCommerce has witnessed it all. Email marketing was the first marketing strategy adopted by the eCommerce sites, which included sending out personalized emails and newsletters to the customers, reminding them about the things they have left out in the cart and many other methods of staying in touch with the users. As the social media began trending, eCommerce has got a number of platforms to advertise and improve its market. But it is equally important to notice if all these are actually facilitating the growth of eCommerce sales or not. Simple efforts like better picture quality, multiple payment options, and user-friendliness etc. have proved out to be effective measures to improve the eCommerce sales. And the latest trend added to the list is web push notifications. 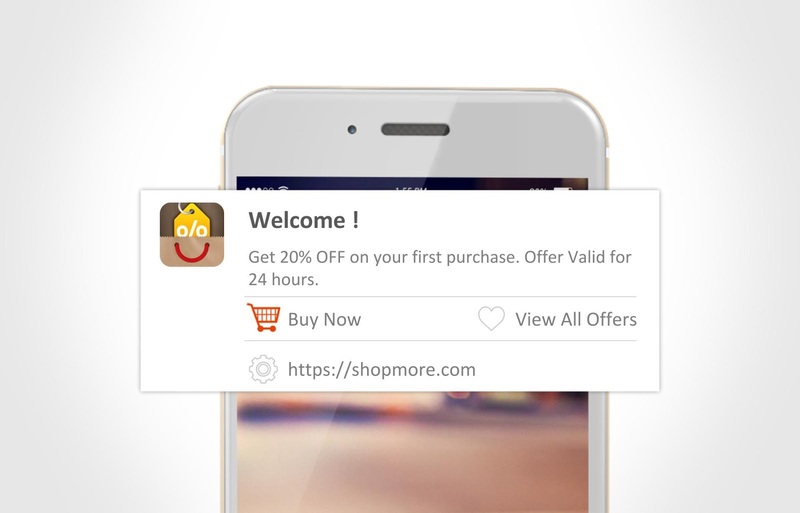 Web push notifications through new to strategies which entail eCommerce marketing ideas have emerged as productive means of improving the business sales. This is major because of the simplicity their use is associated with. 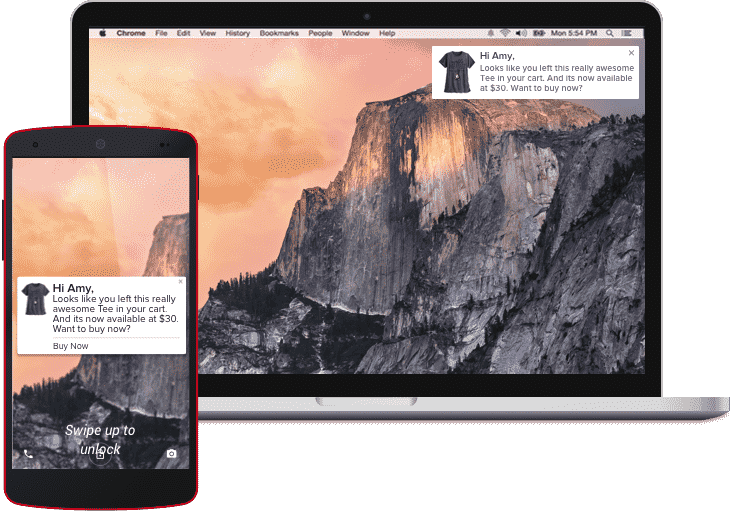 Web push notifications are nothing but the messages from the websites, delivered to your mobile or desktop or any other device which are mostly used for instant delivery of information. We all have already witnessed receiving notifications from mobile apps over the past few years, while web push notifications are making a new start in the digital marketing world. Though there are many means of improving the eCommerce sales, web push notifications have turned out to be an effective marketing strategy. Unlike the mobile push notifications which work only on the mobiles or tablets, web notifications work on all kinds of devices even if the website is not opened. Web push notifications are easy to implement in one’s website as they are easy to compose and do not require meeting any design standards. As soon as the visitor of the website goes through the ‘Opt-in’, ‘Allow notifications’ steps the website is permitted to push the notifications on to the subscriber’s device. 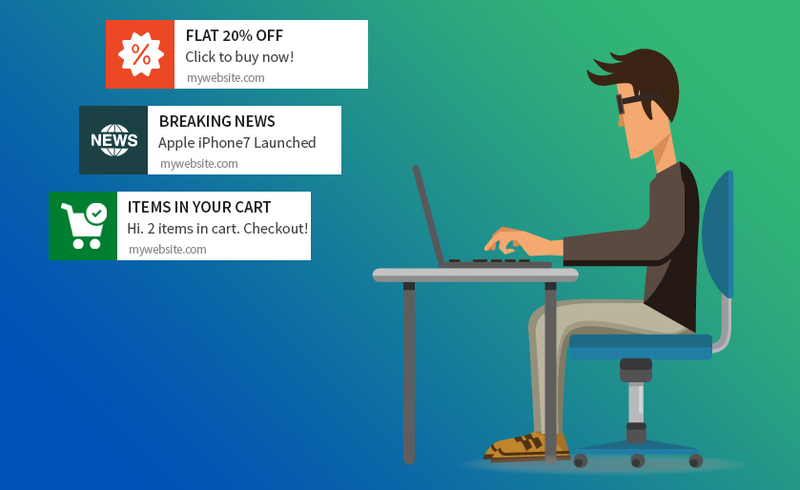 Let us now see how exactly these web push notifications can be effectively used to improve the eCommerce sales. Your business staff might be sending emails to your subscribers about the new arrivals in your store. But how interested would the customer be to open his / her inbox frequently and check the regular updates about your business? Studies indicate that 40% of the people check their inbox around 2-3 times a day. However, the chances of them opening the emails from your business are very thin as no one is on a 24-hour shopping spree every day. But what if you want to send some important information to the customer; for example, the news about the new book of their favorite author (which you have guessed based on their previous purchases) made available on your store and there are only a few copies left! Web push notifications not only help send this message instantly but also would increase customer loyalty towards your website as you have given importance to the likes of the customer. This would make the customer make your website his first choice during his next purchase. When you are running a business which offers a wide range of products, push notifications are a must. Customized messages based on the user preferences can help increase the sales because the messages are sent after filtering out the customers based on their previous product search. A customer interested in clothing sent the messages about the discount offers available in the clothing section alone. He should not send messages about the books collection, which are completely irrelevant to him. Otherwise, you are trying not to annoy the audience by not sending frequent notifications about all the available products, thus improving the customers’ interests in your site. Supposing that the customer has left out a few items in his cart and has not returned to purchase them for a significant number of days, what could be the best thing to do to remind them about the same? Well, sending an email might help but web push notifications would help in a much better way. This is because the click rates of push notifications are relatively high when compared to those of emails. You can even plan for a discount offer on those products if bought before a certain date, send this information to the user through a push notification and see if this works. This helps not only in reminding the customer about his cart but also would reduce the loss you have to incur because of such cart abandonment. Which business would not like to bring back its users who have been inactive on its website or app? Sending a mail to such users would be of no use since it is clearly evident that these users have almost forgotten about your site. Web push notifications again come to your rescue. Clearance sales and holiday sales campaigns can be initiated targeting such users. Though the messages are sent to both active and inactive users, web push notifications are a better channel to reach the infrequent visitors. Price of products is one of the most important factors that determine customer engagement with your business. Thus, it is very desirable on the part of the customer to know if there is a price change in the products of his / her wish list. Web push notifications are very useful in this case, as there is immediate delivery of this price-change information to the user, making the user more interested to buy the product. Studies claim that this activity has led to a considerable increase in eCommerce sales. Up-selling is that process where you make the customer agree to pay more than what he has decided to pay for a particular product or even make the customer purchase additional products. Cross-selling is the process in which you suggest a different product to an existing customer. Both of these can be effectively implemented by making use of the web push notifications. And the point to be noted in this case is to send personalized messages to the customers, instead of sending random or irrelevant messages. It is estimated that there is around 70% probability that the existing customers would buy your products when notified through web push notifications, thus increasing the sales. Keeping in view the points mentioned above, web push notifications can definitely work as effective sources of increasing the eCommerce sales. 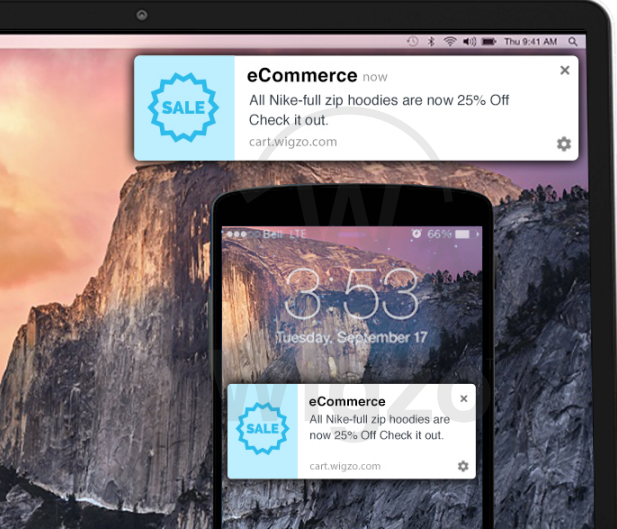 Incorporate web push notifications in your eCommerce marketing strategy. If you have any doubts or concerns on how to increase eCommerce sales, feel free to drop a line or two in the comments section. I shall reply in a day or two. Keep watching this space for insights on eCommerce marketing strategies. Cheers!